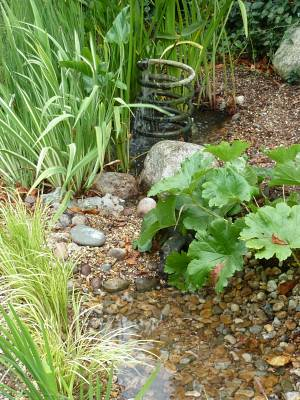 Rain gardens are a relatively new approach on how to deal with water in the environment. 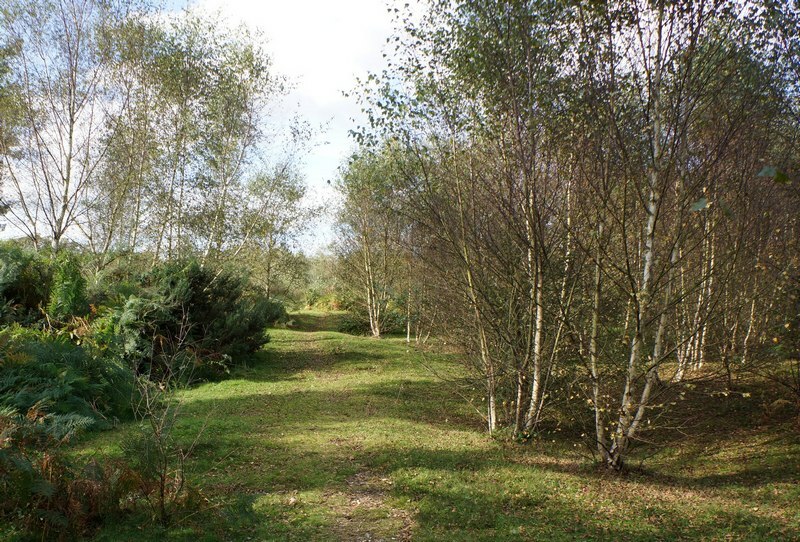 In the last 10-15 years, there has been a big rise in the use of SUDS (sustainable urban drainage systems), the practice of delaying the entry of rainwater into the drainage system by the use of swales, ditches and ponds. 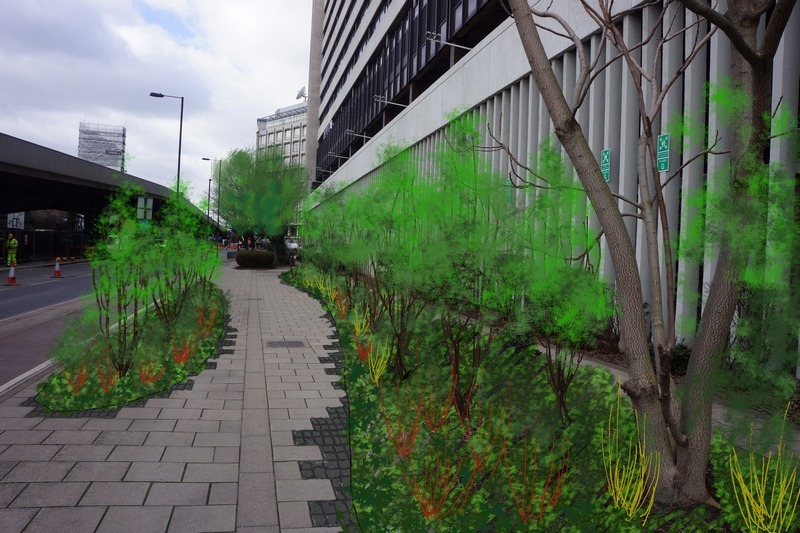 However, this is generally the domain of engineers who are mostly concerned with their pipework; rain gardens, on the other hand, do the same thing, but are equally concerned with aesthetics and ecology – and so are far more exciting. Easily applied to the domestic situation, but the concept works just as well in urban and commercial design. In fact, WSUD – Water Sensative Urban Design – looks set to take on this wider role in the municipal environment, possibly replacing SUDS. 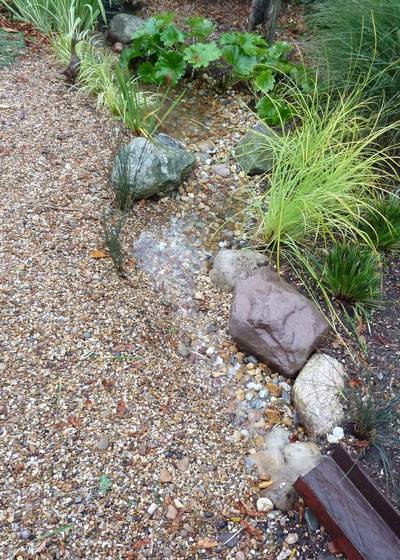 Having built many water gardens in my life, I decided (in 2010) it was time to build a rain garden in my own home, where I could enjoy it and also monitor its performance. These pictures show the just-completed garden, only a few months old; it also rained right on cue and appeared to be working well! 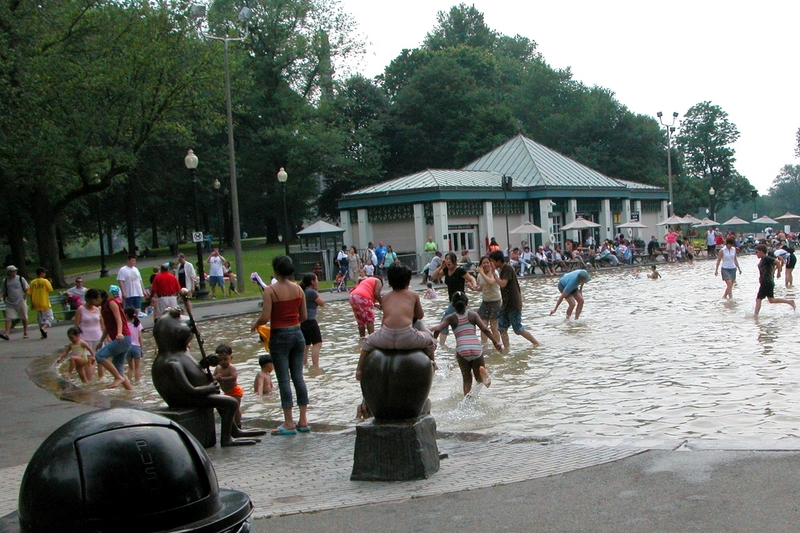 The coil is an old water heater pipe and acts as a fountain – this pond has always been there. 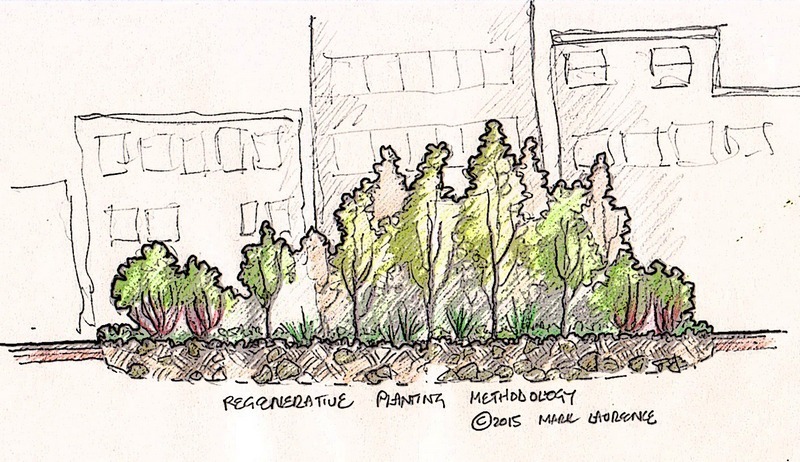 So what is the “philosophy” of a rain garden: why build one? Well, flood prevention is one answer; if you have ever experienced floods in your area, you have directly or indirectly contributed to them. If the rain didn’t fall on your actual roof, it fell on part of the urban fabric that has been built to support you. Another answer is to re-charge ground water supplies; many urban areas have groundwater levels that are dropping due to the fact that rain cannot permeate the land where it falls (95% of urban land is impermeable). Water tables are also dropping because we are abstracting water far more quickly than it is being replenished. 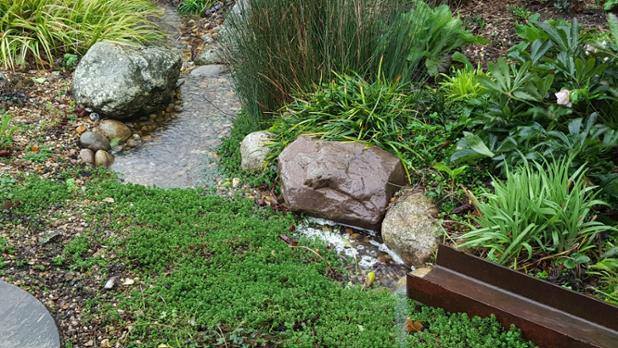 Rain gardens are a great way to re-connect with nature, opening you up to the experience of natural rhythms and process. It will sit there quietly in hot weather, dry, yet still a micro climate for flora and fauna that like a little extra moisture, in the lowest parts, providing free drainage to the drier areas. When it rains, though, the garden comes to life; water from the roof of your house, instead of disappearing down the drain, starts running into the areas of dips and dry ponds you have created, perhaps having topped up your rainwater butts first. Gradually pools start appearing and maybe in a heavy downpour, water starts running between them. How long it then takes to dissipate will depend upon your soil type; I’m on an alluvial soil, so it is very free draining; on heavy clay it might take days for the water to disperse, and this might mostly be from evaporation. This is good too as it helps re-charge the local hydrological cycle, which is also severly lacking sufficient moisture content, and may well be a significant but overlooked driver of climate change. If you have limited space or can’t allow water to rise beyond a certain level (after all, you don’t want to move the flood potential from somewhere further away, to your own home! ), then you might need an overflow which puts any surplus water back to drain, or perhaps (and preferably) to another part of the garden. You will have still considerably delayed the timing of water going to drain, as well as the volume. In my garden, I have disconnected one of the main roof downpipes (which it turned out was blocked) and used an old steel channel I found when they demolished the adjacent dairy. 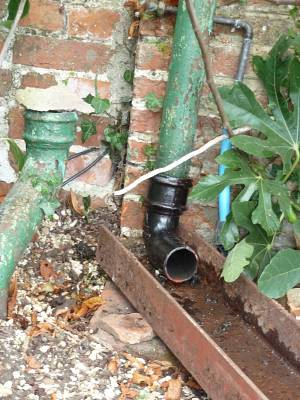 We have old cast-iron downpipes so I bought a 90° bend and fitted that to direct the water into the chute. I then dug a channel and partly lined the bottom with plastic, because our ground is very free draining and I wanted to connect this to an existing small water feature, so that this was topped up by rainfall. Surplus water is then dispersed to the sides, through the planting. If I were designing this from scratch, I would put the pond before the raingarden, so this was topped up first. Having said that, this section of the garden has always been incredibly dry and I’m hoping that the ground will, over time, recharge itself and things will grow better. This dryness is evidenced by the fact that we have a young fig growing well, right by the downpipe. In periods of heavy and prolonged downpours, it may be that the pond will overflow; this will happen at the back and will disperse out away from the house under the bushes. With our soil, I don’t see the need for any further overflow drainage. The roof section that feeds this downpipe is about 50m2, south facing. We get on average 50cm rain per year, so this should capture 25m3/year. This morning in light/medium rainfall, the chute was delivering 3 litres/minute (nowhere near the rate of a hosepipe). The rain garden is about four metres long and I’m not sure how to measure the drainage rate of soil, apart from having the plasticity index measured in a lab but over time I will use these figures to try and calculate how much water is passing through the system; in theory 25m3/year. The soil in this raingarden is a heavy clay and so holds the water for longer. It is bigger than mine and would need to be to increase the percolation area. You can also see that mine is more planted and this is again a condition of its function – theirs was designed to be a play space for the children (which is why I’m so pleased that it is successful). When they have grown up, it can be planted more intensely. 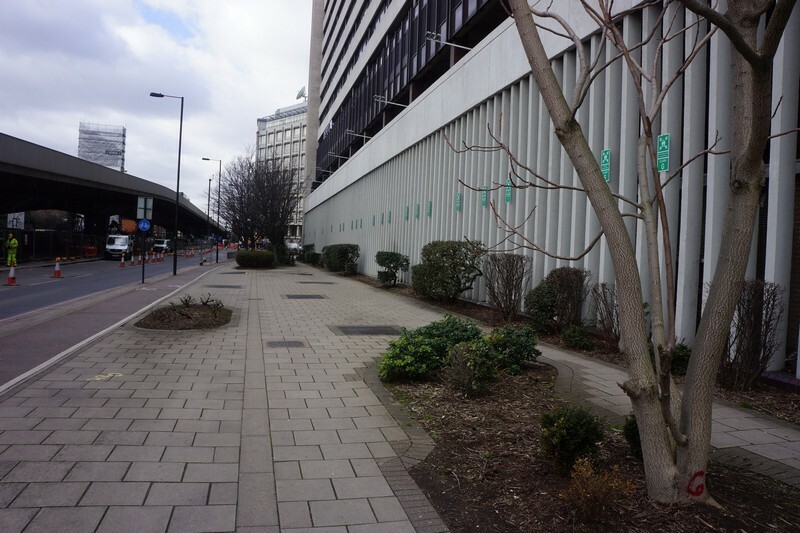 It also created a feature in an otherwise rather awkward, narrow, North-facing space. 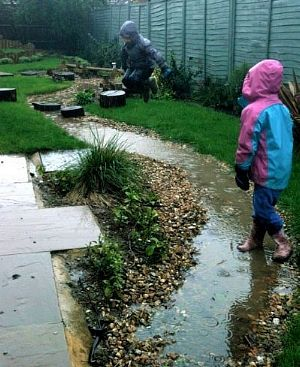 Rainwater management isn’t just for large commercial or public-realm sites, it can be done in your own garden too, with multiple benefits to environment, garden, wildlife and of course, you. This article was first published in 2007 and has been updated 2018. Future gardens will be an integral part of a living bio-system that is part house, part garden, an energy conserving and production environment. It will also be a resource for water retention and cleansing, food production area, biomass and environmental haven. Above all, it must continue to be a sanctuary for the soul and from the world at large. Why do I say this? We cannot consider the future of gardens without accounting for climate change, which is now having a tangible impact on us all. The 2018 IPCC report says we have 12 years left before things reach the point of no return. Whilst there is less talk now about global oil reserves peaking and that energy will be in increasingly short supply, it is still true that we have a long way to go before we have a fully renewable clean energy supply chain. Whatever the outcome, big changes are on the way. So when we look to the future of our gardens, it’s not so much a matter of what style or vogue will be popular, for such things come and go and in this context are not particularly relevant. You might imagine it is a case of asking what will our climate be like and how will gardens adapt. Yet to talk only of adapting plants to suit the changing conditions is actually to miss the main opportunity for our gardens to become part of the solution to global warming and perhaps, even a core part of our individual – and so collective – survival. House-garden water capture, cleansing and re-use schematic. et al. 2009), mostly in urban and suburban areas. This makes them a precious resource and opportunity for change on a big scale. The first thing we have to do is start looking at our environment as a living bio-system; in this case, the house and garden, with its connections to the wider world (air, earth, wind, rain, food, materials, waste, energy, communications). Think of the garden as one cell in a big organism. Almost all the elements this cell needs to survive are coming from outside, beyond its sphere of influence. Yet the way that cell is constructed, used and connected to its immediate surrounds (garden) could, if designed correctly, reduce its dependency on external manmade systems. To decrease those we must increase our connectivity with natural systems, namely the sun, wind and rain. To put it more directly, with have to reduce to a minimum the inputs and outputs of our homes. 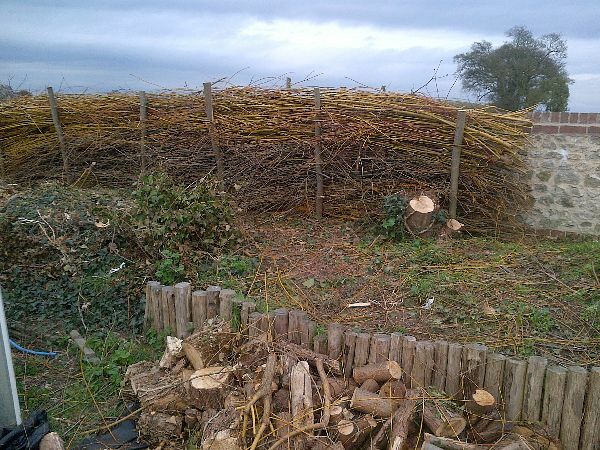 A fedge (fence-hedge) uses biomass grown in the garden to create new boundaries. Good for wildlife and resource conservation. Those items which we cannot produce internally need to be sourced from outside as close to us as possible. Therefore neighbourhood and regional systems need strengthening to minimise production/transport costs. This is particularly true and desirable for food products, but also building materials etc. For that reason, even if we manage to live off-grid – the ultimate, but extreme, conclusion to this line of thought – we cannot do it all alone and live in splendid isolation, nor would most of us want to. 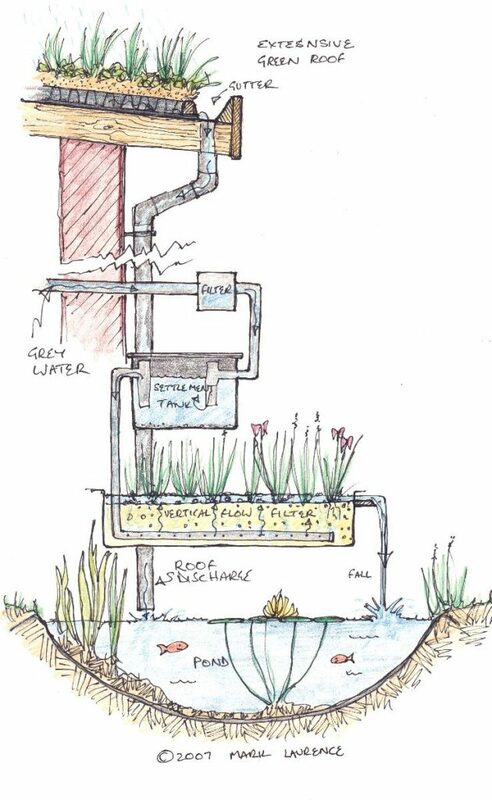 Many bio-systems will only work efficiently when connected together to give sufficient inputs to allow them to function properly (for example, reed-bed sewerage systems). Local community-generated bio-systems are essential to a sustainable future. You may think this all sounds very philanthropic, but where is the incentive to expend all this time and money “greening up” our homes and gardens? Some of the incentive will be economic; for example metered water users already consume about 15% less water than unmetered and government will gradually introduce a number of Carrot and Stick measures. But as cost of pollution will have to be met by industry and so, by consumers, simple economics means that inevitably everything will get more expensive. For many people, I suspect that having a lifestyle that gives independence and doesn’t add to pollution will become increasingly desirable, as we all witness first or second-hand the effects of climate change. Whilst we all see the horrors of hurricanes and droughts in distant lands, at home (for me, the UK) we see increasingly severe flooding etc. right on our own doorstep. Less dependency on outside systems will give increased sense of security in an uncertain world. In all of this, beauty and relaxation will be paramount, so gardens will still fulfil this most traditional and personal of roles, giving us joy, relaxation and sanctuary. For example, looking at a beautiful water system of rills and planted gravel filterbeds is made all the more exciting by knowing it has a useful function and is saving resources. For these principles to be taken up by the average garden-owner and made successful, we must resolve two conflicting issues: the subject needs to be driven by a sense of fun, adventure and positive aspiration to really make a difference and yet we must also avoid the “dumbing-down” or over-simplification of a complex topic, something that can occur when it appears in magazines and TV shows. An example might be solar panels: it would be wonderful to run your garden pond pump, shed, or garden office from solar panels – no cables to the house to bury, a good eco-friendly solution. But you have to balance that ideal with the cost of initial installation (probably greater than laying electric cables from the house), the limitations of supply and the increased maintenance that may be involved. Having got your solar supply, you might be frustrated to find that you can’t charge your battery mower if you didn’t purchase a high enough generative capability. This is typical of a fragmented approach to sustainability – it’s a start but not really useful just thinking of the power to your pond and ignoring that used within the house, or your car. So where are we? Standing on the threshold of an exciting new future, I would say. Technology and information is available as never before, and hooking up to the IoT (internet of things) is great fun and useful too. The brightness, however, is troubled by the looming stormclouds on the horizon and the knowledge that the societal cost of failure is high – and will be witnessed by ourselves but paid for by our children. I do firmly believe that we can all make effective choices in what we do and in what we demand of the world, of business and our societies. We have to make rational choices and sometimes temper our own personal indulgence. Gas or electric patio heaters may be a nice luxury but the environmental damage is not justifiable. Maybe a log burning fire basket is, provided we do other things to counter the carbon emissions, such as growing more bio-mass. Extra woolly jumpers may simply be the best bet along with passive solar designed spaces! Most issues simply come down to us making informed decisions and balancing personal ease with environmental sanity. Remember, what sounds “eco” or fringe today, is going to be tomorrow’s norm. Get out there, explore ideas and enjoy being the change!